DEADLINE: Friday, December 7, 2018- 5:00 p.m. Applications are now being accepted for 2018-2019 AISD Teacher Grants. Please use the button below to download the application form. Grant Applications should be submitted to the Arlington ISD Education Foundation electronically only. Applications are to be typed, employ proper grammar and spelling, signed, and completed. There is a $10,000 maximum per application. Email application as a Word document attachment or scanned PDF attachment to ahardin@aisd.net. Grants will be awarded in early 2019. For questions please email grants@arlingtonEF.org. Do not include this instruction page or grant guidelines as part of your application. 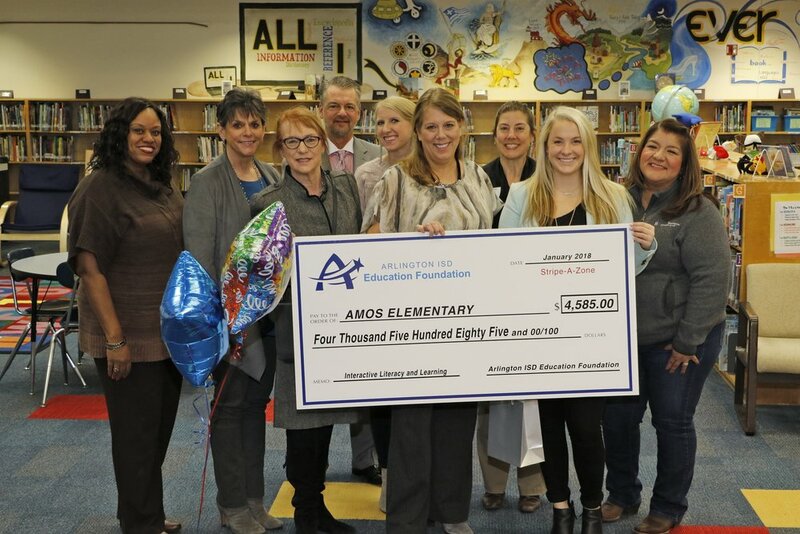 The Arlington ISD Education Foundation (AISD-EF) is offering teachers and administrators the opportunity to apply for grants to support innovative programs or projects that enhance student academic performance and support the objectives, goals, and initiatives of the Arlington ISD, and reward creative approaches to support higher levels of student learning. Individuals or teams of individuals employed by the AISD who are involved in the instruction of students or related support services benefiting students are eligible to apply. Teacher-initiated applications must support the AISD Strategic Plan and be signed by the principal. Applications will be reviewed by committee and recommendations will be made to the AISD-EF Board for final approval. Applicants will be notified by email of decisions by the AISD-EF. All awards will be managed by the AISD. PLEASE NOTE: All applications must be submitted to the AISD-EF only electronically. Applications received after the submission due date will not be accepted. Grants may fund instructional and classroom materials, parent involvement programs, or any activity or material which supports higher levels of student academic achievement. The awards must be used for the purposes intended. The program/project must be fully implemented and the final report must be submitted to the AISD-EF complete and on time before recipients may submit an application for another grant. Grant recipients must agree to share successful procedures in staff development sessions. The number of awards will depend upon the quality of applications received and on funds available from the Arlington ISD Education Foundation. Collaboration among networks and campuses is highly encouraged. When creating your budget, research carefully and be realistic. Small grants are just as likely to be awarded as large grants. Partial finding will be considered so please include other funding sources if applicable. Funds will not be awarded for budgeted items available from district resources. The AISD vendor list is a good source to help determine the cost of an item. The degree to which the proposal represents a creative or innovative approach to the accomplishment of objectives. Funds are not typically available for recurring programs/projects. (The proposal should address a new project as opposed to one accomplished or under way.) Grants are to be used to fund programs/projects that cannot be provided for in the school and district budgets. Salaries for contract positions will not be funded.